Fieno del fieno il relativo giorno di donna is the Babelfish translation for Hay Hay Its Donna Day. Cenzina has posted Hay Hay Its Donna Day #8 . Cenzina is our first European host and has selected a well known Italian recipe for the challenge. Couldn't you just tuck into a bowl of her Tempo di Risotto right now. I'm sure it tastes as good as it looks. This month's challenge is very special as it is the 1st anniversary of the Hay Hay Its Donna Day challenge. And to make the event even more special Cenzina has arranged a wonderful prize for the winner of the best risotto. We are very grateful to the lovely people at Sal Lorenzo for their generous goody box of Italian specialities. Drop by and say bonjourno to them. Visit Cenzina at il cavoletto di bruxelles for the risotto recipe and competition details. 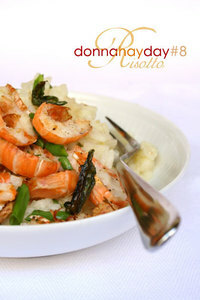 You may choose to make the recipe as written or design your own risotto using the basic method. Send your entries to Cenzina at risottofordonna(at)gmail(dot)com by the 27th November. Cenzina and I look forward to lots of risotto ideas from you all.